So, when I last blogged, I was telling you about how I was an elite athlete fueled by Froot Loops. Stranger things have happened. Before we even really got to sleep the night after the 10K, we were back up and heading towards the buses for the half marathon. 2:30am, y’all. 2:30am! That’s what time we woke up so we could catch the 3am bus to Epcot, where we’d move into corrals and start the race. Before we could do that, we had to sit in the big parking lot leading up to the corrals, and because we got there so early, we were right up at the front where we waited for the race director to wave us all onto the road to the starting line. We started walking with thousands of other people, everyone focused and ready to just do this thing already. And that? Is where we encountered some trouble. My mother-in-law has already mentioned it on Facebook, so I’m taking that as permission to blog about it here. Sandi is a very active, young 59 years old…. but she’s still 59 years old. And she broke her arm a few months ago and hasn’t been out of a cast that long. I had already told Wes that I was walking the whole 13.1 miles with her to make sure she stayed injury-free and made it to the finish line, and I was prepared to do just that. Y’all, we were not even ten steps onto the road to the starting corrals when Sandi tripped and fell. 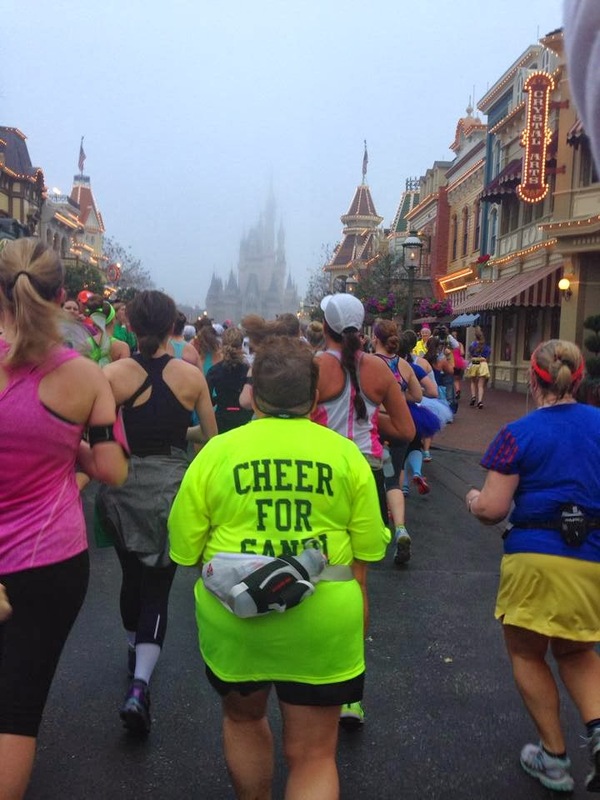 In a crowd of thousands of excited Disney runners. Clearly, I was doing a great job! “Oh, my gosh, Sandi!,” I remember yelling. “Are you okay? !” She managed to get up without getting trampled in that crowd, which meant she was doing awesome. “I’m good!,” she kept insisting, telling me that she’d fallen without letting her previously broken arm hit the ground with her. This good news distracted me from the very obvious fact that blood was GUSHING from her knee! “Oh, my gosh, Sandi!,” I yelled when I saw it. She reluctantly agreed when we got to the corrals and was likely thinking murderous thoughts towards me as I told a race official the situation and asked him to have a medic sent over. (But, hey, I’m her daughter-in-law, married to her perfect, most beloved only son, so this is likely not the first time she’s had murderous thoughts towards me. It’s all good!) We waited an hour…. no medic ever came. Way to drop the ball, Disney! I was hacked off, but Sandi’s knee had stopped bleeding. So… we were good to go? I wasn’t sure, but we were going anyway! Sandi took off at a walking pace that was fast enough that I could have jogged next to her the entire race and still fallen behind. She was wearing a neon green shirt that no one could miss, so I’d tell her to go on ahead, wait until she was way far away, then run to catch up. We did this for the first four miles while I also snacked on Froot Loops. Yes, this is the first half marathon where I’ve actually eaten ON the course! Delicious. And in the more Jenn-friendly, non-elite corral we were in, people were actually telling me how smart I was in my fuel of choice, unlike the judging looks I’d gotten in the A corral. These were my people, y’all. Everyone needs to run Disney with their own personal photographer running along with them, y’all. Seriously. 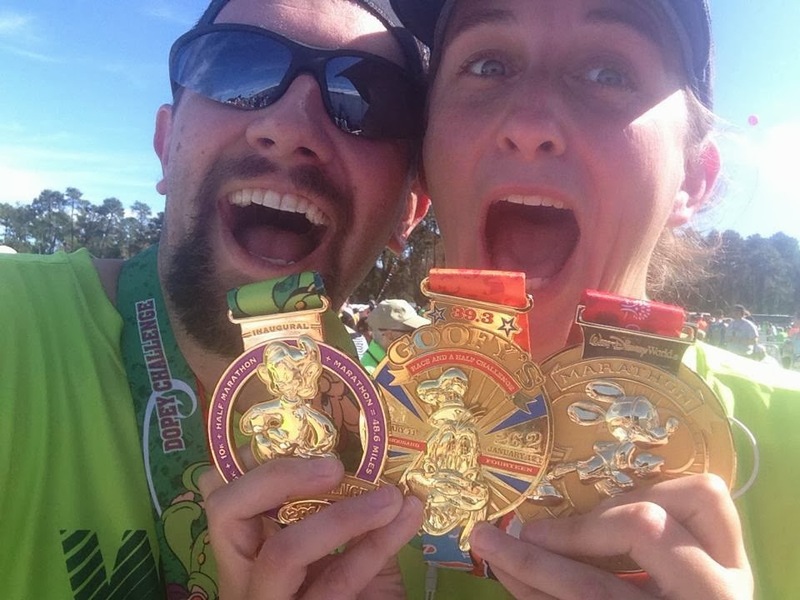 We left the Magic Kingdom at mile six and entered the tightest three miles on the course. This is also where the “girl power” singing started taking place. Oh, my. 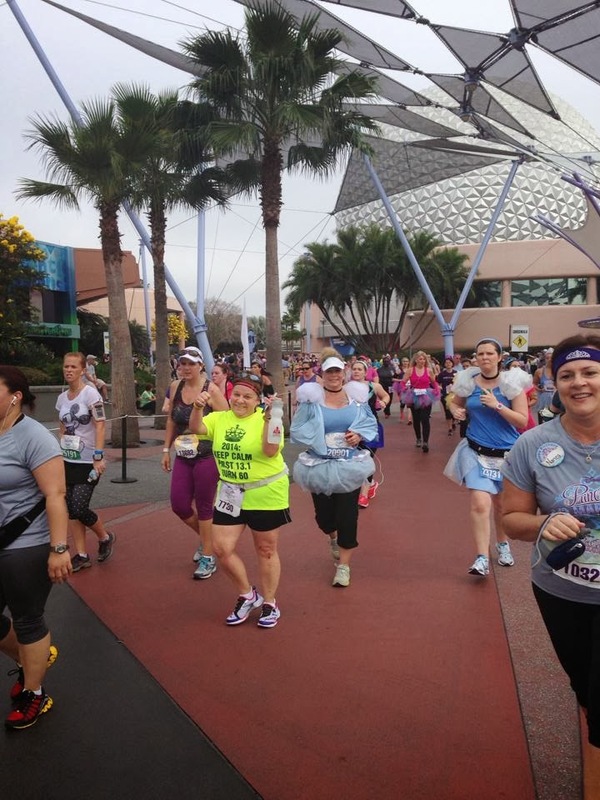 I’m as girly as the next girl, but even I don’t spontaneously bust out and sing, “Let it Go” at the top of my lungs like these Disney running girls were doing. I was tempted to sing along with my iPod just as loudly, but “Billie Jean” is probably best left to Michael Jackson, so I refrained. I lost Sandi a couple of times during those tight miles as the sun finally came out and the humidity got worse. She was still going, though! These guys are at ALL of the Disney races, and Wes has NEVER let me stop for a picture. He thinks races are for running or something. Whatever. I was so excited to stop for this one and told Sandi to go on ahead and that I’d catch up. 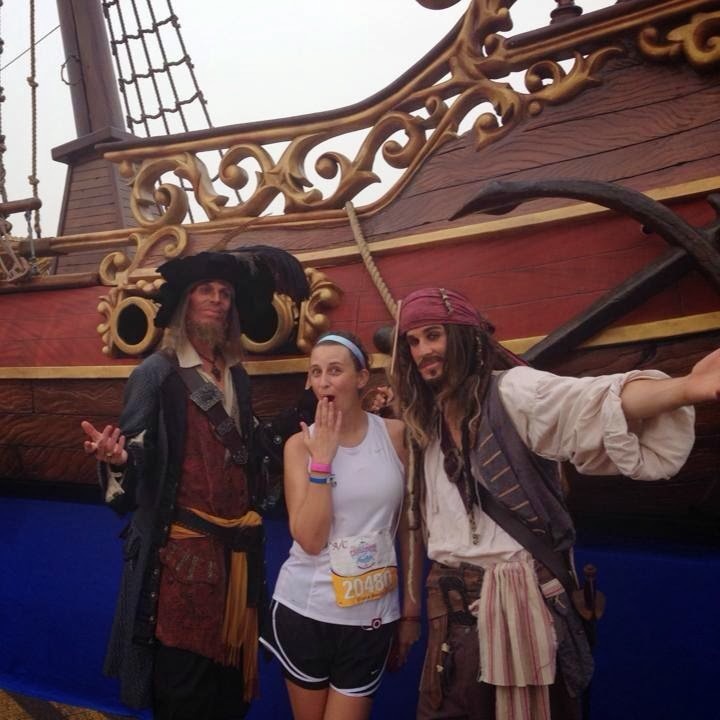 We met up at mile ten, and I was so excited about my pirate picture that I just kept right on going until mile eleven… where I couldn’t find Sandi! 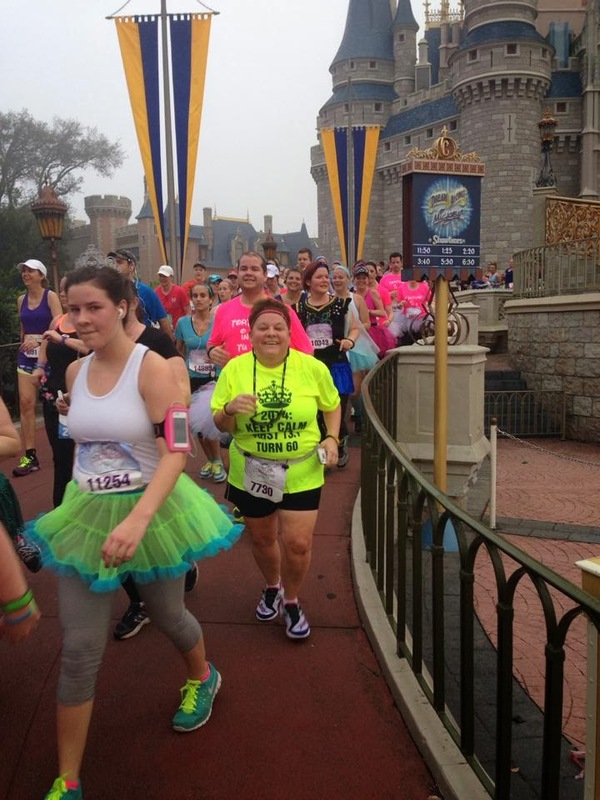 Praise God for that neon shirt, though, because I saw her half a mile later, heading towards mile twelve. “You’re so close to the finish!,” I told her. And it was. I ran ahead to get this great picture…. Her first 13.1! And she was still smiling at the end! So was I… well, kinda. Maybe my smile looked forced because that shirt was the same shirt I’d worn for the 10K. Silly Jenn only packed one shirt, y’all. One smelly, smelly shirt. And to make matters worse, I’m no good at the selfie pictures. That’s why I need Wes with me to do them. My post-race selfies pictures are always better when he’s holding the phone with me. See? Well, maybe that’s not so great either. Maybe we should leave the phones at home for the next race, huh? 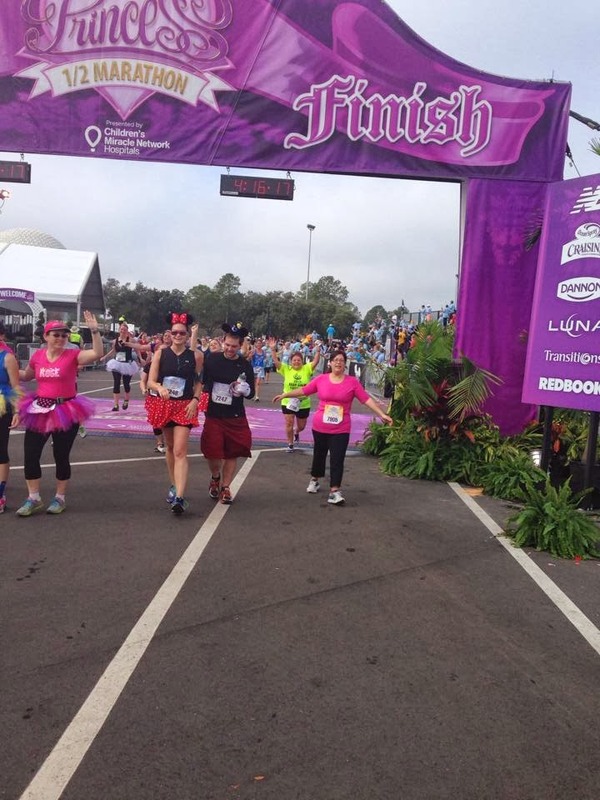 Anyway, hooray for finishing the WDW Princess Half Marathon! 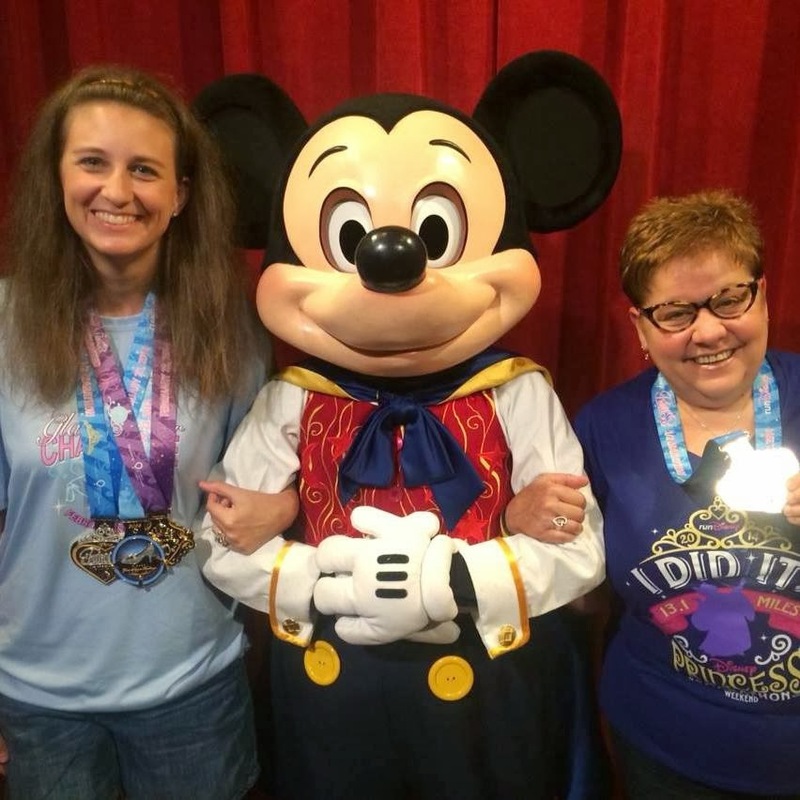 It was such a fun weekend and such a great experience, watching my mother-in-law reach this goal. 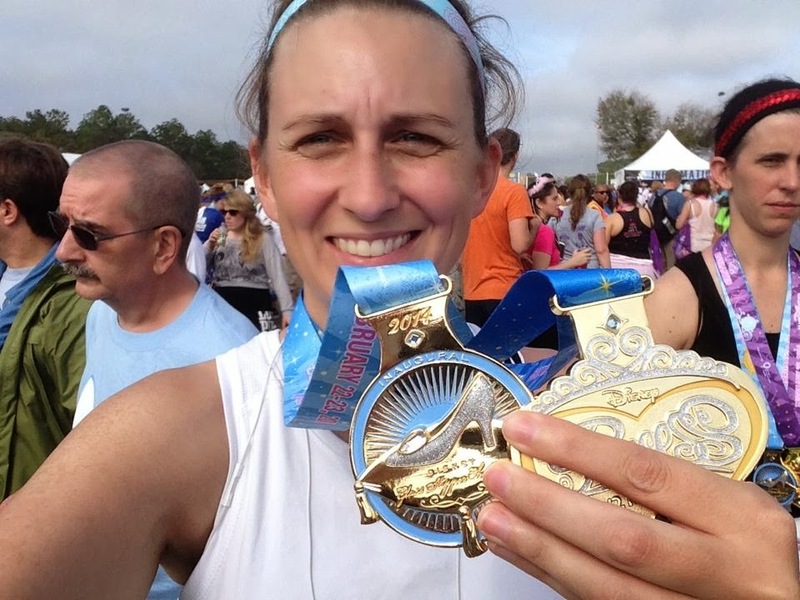 Here’s to many, many more half marathons for Sandi!